MOSCOW — He has ridden shirtless on a horse in Siberia, piloted a hand glider with migratory birds, swum with dolphins, tossed judo opponents, and dived into the depths of Lake Baikal and the Black Sea. He is Russia’s president, Vladimir V. Putin, and he added to his public repertoire of feats on Sunday by showing off his skills as a pianist. He was in Beijing for the “One Belt, One Road” initiative, a $1 trillion plan for infrastructure and economic development in some 60 countries. 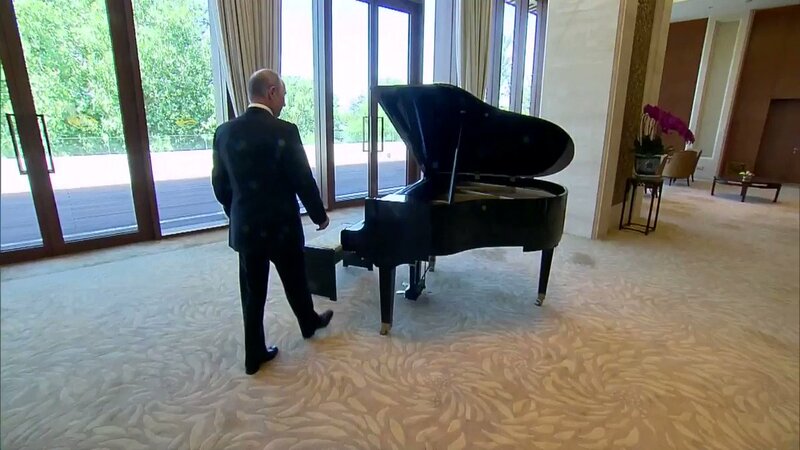 And while waiting at a state guesthouse for China’s president, Xi Jinping, Mr. Putin sat down at a grand piano and played two tunes: “Evening Song,” by Vasily Solovyov-Sedoi, and “Moscow Windows,” by Tikhon Khrennikov. Both songs are from the late 1950s, when Mr. Putin, 64, was a child and the Soviet Union was emerging from the shadow of Stalin, who died in 1953.The recital showed perhaps a softer side of Mr. Putin, an authoritarian leader who has been in power since 1999 and has often appeared eager to be seen as manly. President Xi Jinping of China, right, and Mr. Putin arriving for a banquet at the forum. Mr. Putin performed both tunes without a vocal accompaniment. It was not the Russian leader’s first time playing music in public: He performed “Blueberry Hill” at a 2010 charity event attended by celebrities like the actors Sharon Stone and Gérard Depardieu in St. Petersburg, and “Moscow Windows” at a 2014 event at the Moscow Engineering Physics Institute. Mr. Putin’s spokesman, Dmitri S. Peskov, told journalists in Beijing that “while Mr. Putin was waiting for a bilateral meeting with Xi Jinping, the president studied some papers, prepared for the meeting and also played piano,” as quoted by Gazeta.ru, a Russian news website. Chinese propaganda chiefs did not appear to be amused that Mr. Xi had been upstaged to some extent at his own conference, and the official Chinese news media pointedly made little mention of the piano performance. But Mr. Putin’s piano playing seemed to strike a chord with Chinese social media users. Female users posted notes online saying he was handsome. (Mr. Putin has long been popular among Chinese women as a symbol of manliness.) Other social media users were quick to suggest that their country’s leaders also had musical talent. One user of Weibo, a popular Chinese microblogging site, posted one photograph of Mr. Putin, and six images of former President Jiang Zemin playing piano, a traditional Chinese flute, two kinds of traditional stringed instruments and even a Hawaiian guitar. Continue reading the main stor“Evening Song,” usually performed with lyrics by Aleksandr Churkin, was written in 1957 and is considered an unofficial anthem of St. Petersburg, Mr. Putin’s hometown, formerly known as Leningrad.